After having climbed suicide cliff barefoot and by night, I still had to more. 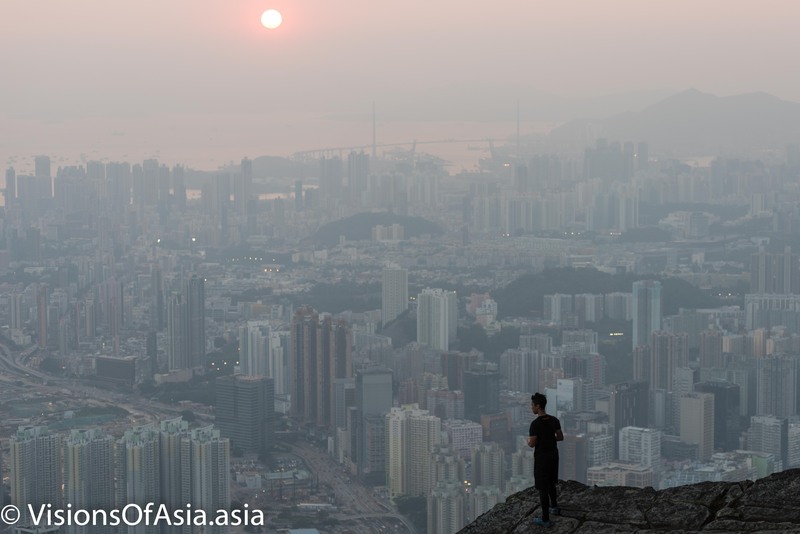 That’s why, last Sunday, I decided to do a night barefoot hike on Kowloon Peak to catch the sunrise. 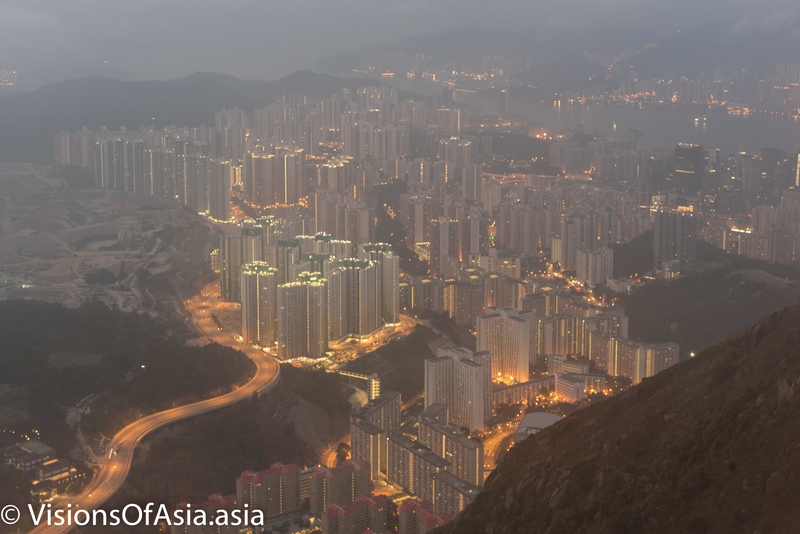 Although I live very close to Kowloon Peak, arriving at the top on time still requires starting off early. I thus left my home at 3.30 in the morning. Being night time as since I was alone, I decided not to climb via the Suicide cliff, as it would have been too risky. I took the stairs on Fei Ngo Shan road. As I do now more or less regularly barefoot running, my cardio has improved. I managed to climb without making any pause. This being said, being barefoot also requires me to be slower and to watch where I set my feet. I had a headlamp as hiking by night requires you to see where you walk, all the more as you hike barefoot. Upon arrival, it was still dark, although the first embers of dawn could be glimpsed. However, very annoyingly, the tip of the mountain was covered in clouds (and was quite windy too). Topping 500 meters, Kowloon Peak is often shrouded in clouds. 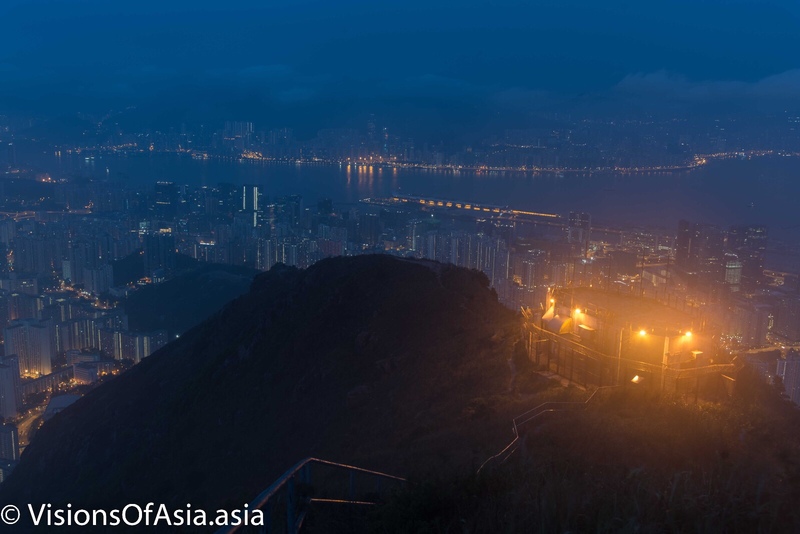 Taking a pic on the helipad of Kowloon peak with my walking torch. I then sheltered from the wind. As the daylight was slowly increasing, I attempted to shoot some pics of the city. Unfortunately, given the strong winds, my tripod was not so stable, so several shots were spoiled. I still managed to shoot some pics with my iphone on a moment where the clouds parted. Later, towards 6 AM, as the dawn was breaking, and the sky started taking the “blue hour” color. Fortunately, the clouds and the fog also started dissipating. The blue hour also manifested itself in this picture. It must be said that the clouds kept covering the top of Kowloon Peak. 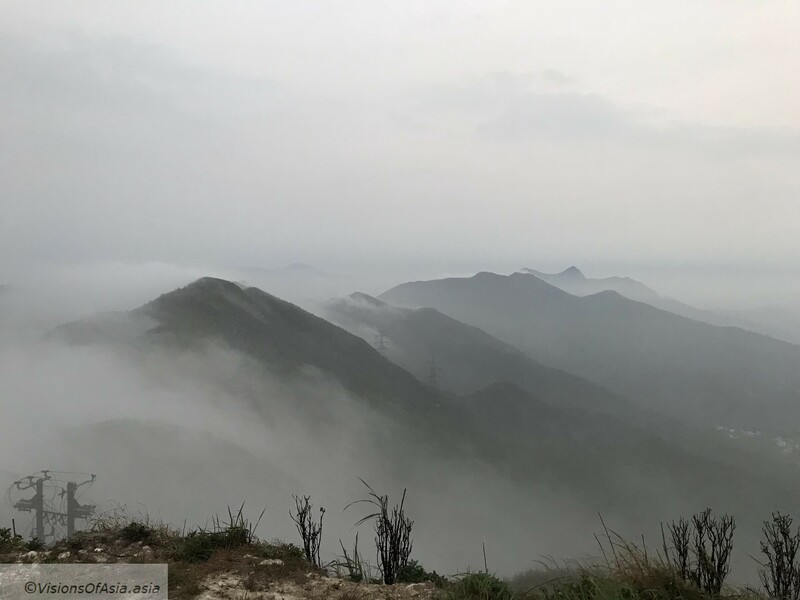 This gave however a lovely feeling to the area, as Kowloon peak is one of the few places where you can be said to be “walking in the clouds”. The winds at the top were quite strong, so I was not too adventurous when flying my Mavic Pro. I tried however to take some context pictures that would show the area and how it really feels. 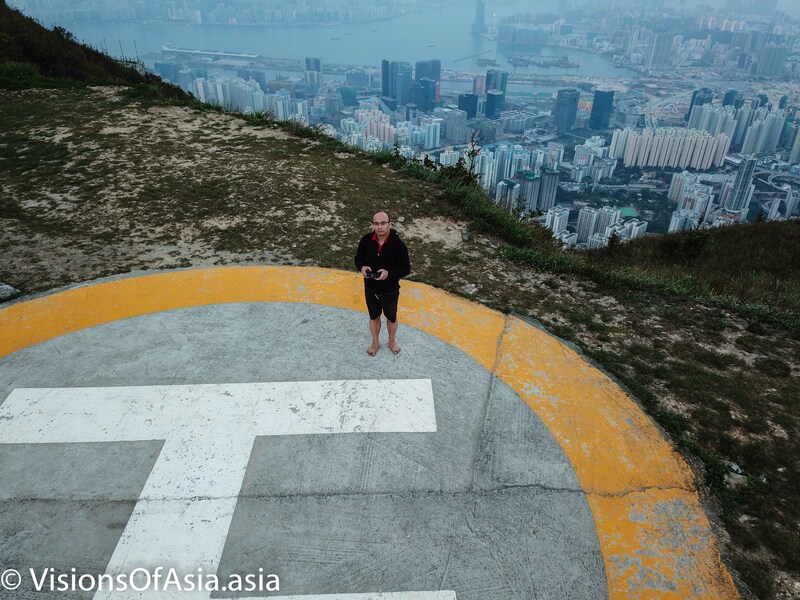 For example, an iconic shot at the top of Kowloon peak is the helipad on the top. 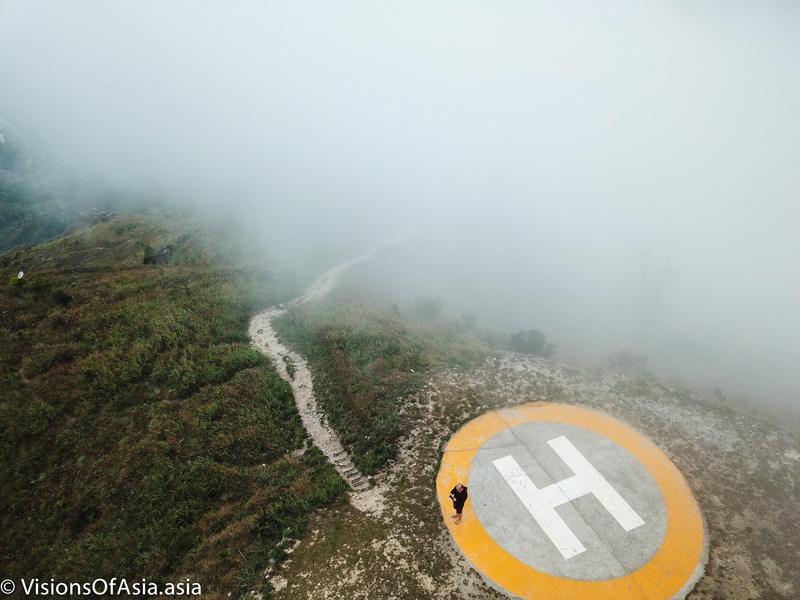 A “dronie” with the helipad helps to show the path down from the top of the mountain. 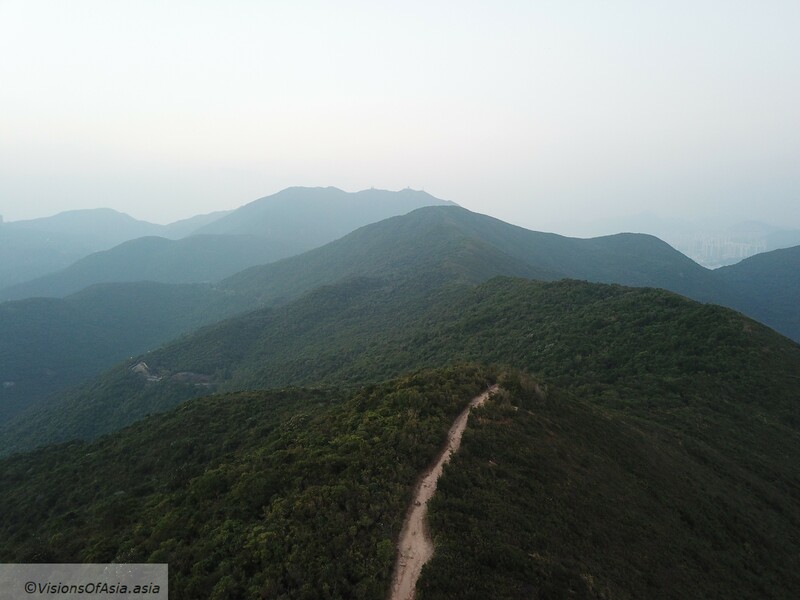 A dronie from the platform of Kowloon Peak. Kowloon peak also has very gorgeous view on Kowloon itself. As the dawn advanced, the clouds started to clear up, but on the other ridges of Kowloon peak, it gave a lovely Chinese watercolor effect. Normally, going down should be quicker than going up. That’s true but when barefoot, you have to be more careful, obviously. The danger is not so much about hurting your feet as of losing your balance. The technique I used is to land on my forefoot (similar to barefoot running) and being watchful when resting the remainder of my foot; indeed, landing on a pebble might be discomfortable (or even slightly painful), but with training, you take it in stride (your foot redistributes the weight differently). If you jump or land too heavily, there is a risk of losing balance (I had a rucksack and a tripod) and falling. 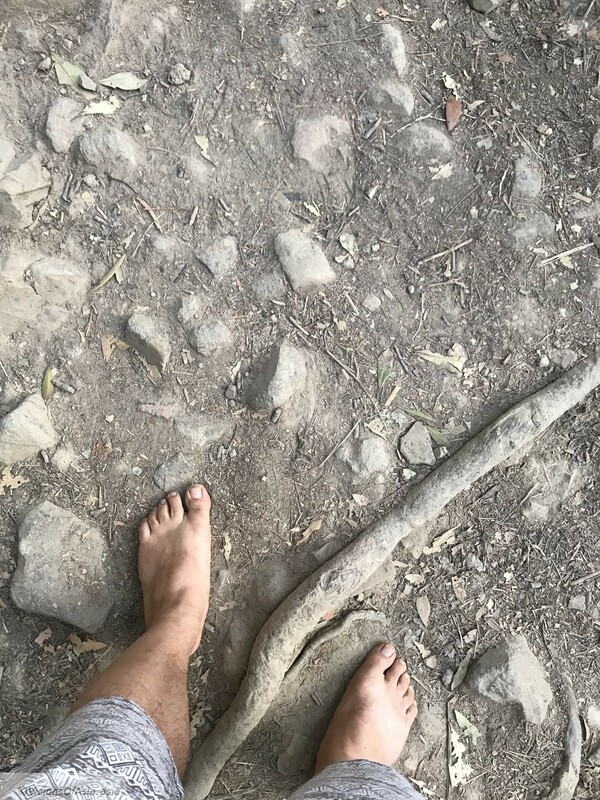 That’s why, barefoot hiking should be done with as light gear as possible. 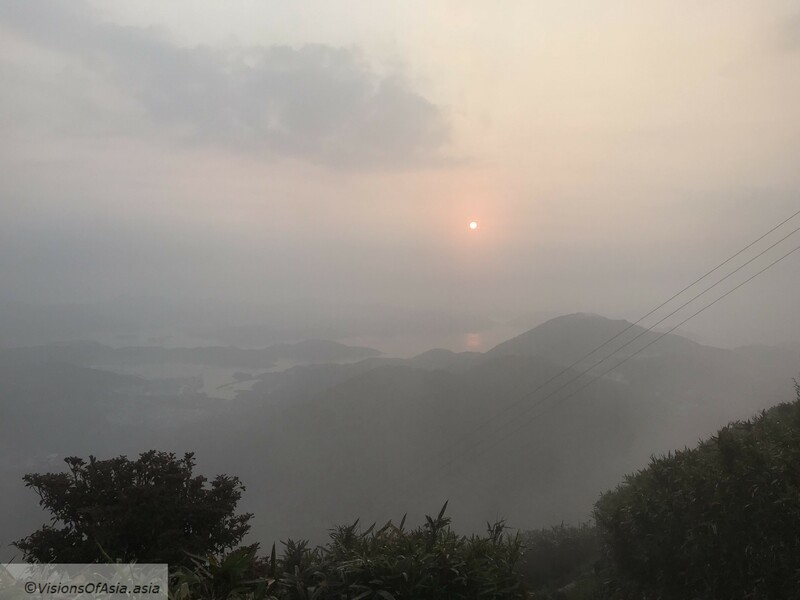 On the whole, the sunrise experience was perfect in the timing and the pleasure of hiking barefoot in the mountain, but a bit marred by the lack of sunrise. I only got to see some sun when going down. Happy New Year: ending 2017 with a barefoot hike on Dragon’s Back! 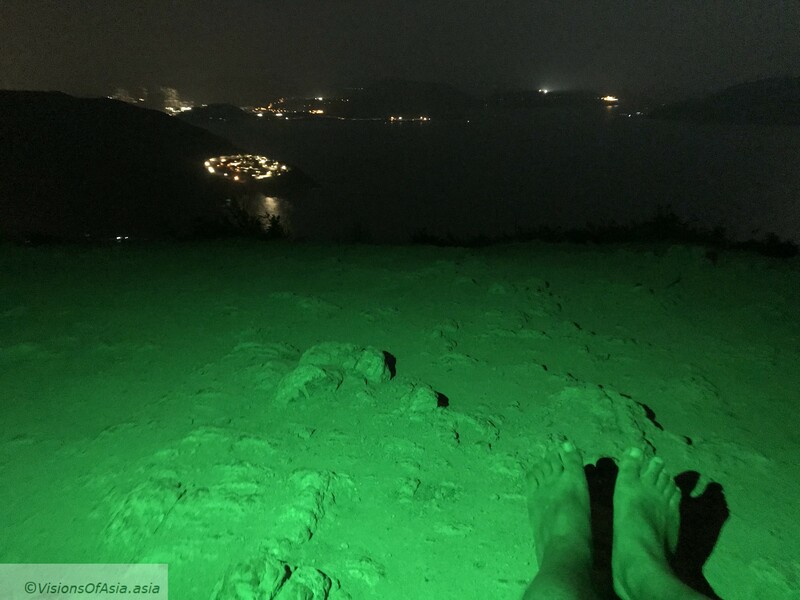 January 2, 2018 March 22, 2018 VoAadmin Drone, Hiking, Hong Kong, Night photography, PhotographyTagged barefoot, barefoot hiking, Dragon's Back, drone, hiking, Mavic Pro, nightLeave a Comment on Happy New Year: ending 2017 with a barefoot hike on Dragon’s Back! Originally, before starting on my barefoot hike on suicide cliff, I had planned on starting barefoot hiking by a first barefoot hike on Dragon’s Back. The reason being that the Dragon’s back is fairly easy and straightforward and has none of the habitual dangers associated with hiking in a mountain. Things turned differently, and I started the harder exercise before the easiest. 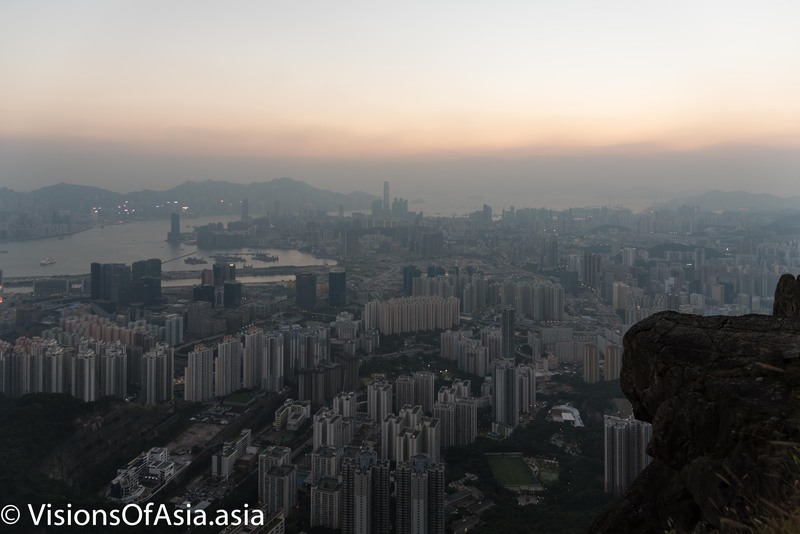 The Dragon’s back is one of the most populated hikes in Hong Kong. 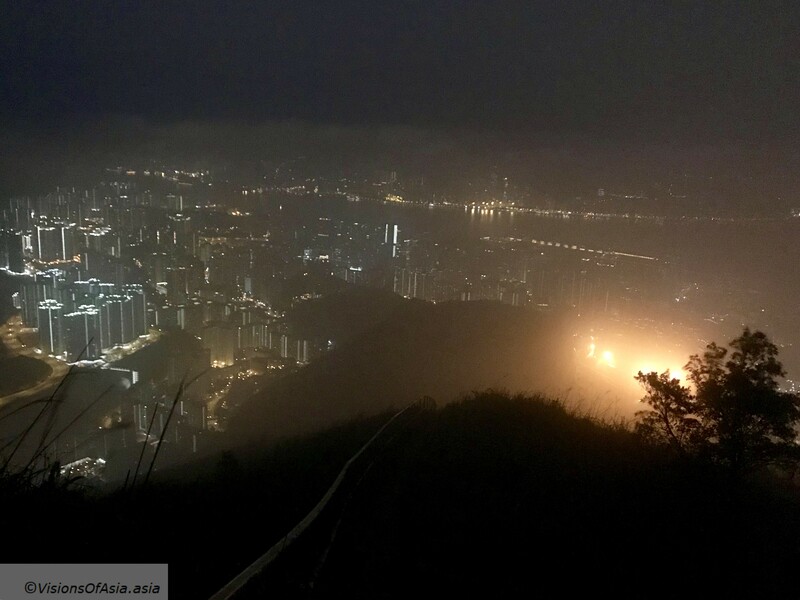 So, to celebrate the year end, I decided to go on the Dragon’s Back in the evening to enjoy the last sunset of the year and the absence of people. I even spotted a guy with Vibrams walking on this trail! 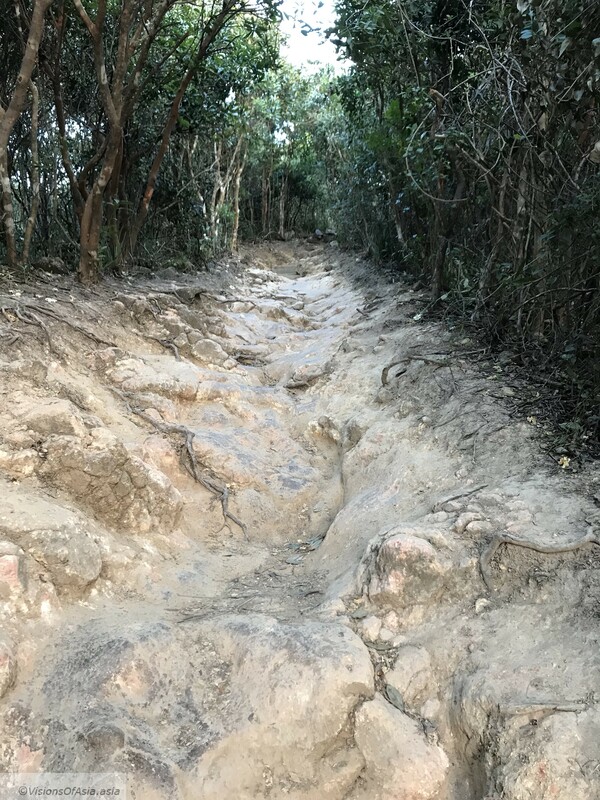 While not cemented, the Dragon’s Back is one of the easiest trail available in Hong Kong. In fact, most of the terrain is sandy with a few rocky passages. Given the absence of gravel, it provides a lovely terrain for learning to hike barefoot if you are not yet familiar with the exercise. 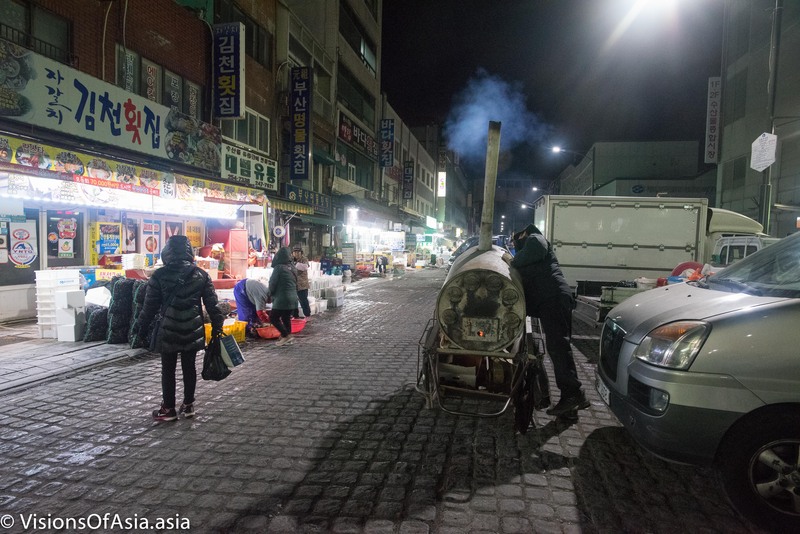 The initial two to three kilometers of the Dragon’s back are stony but very walkable. Although the terrain is stony and filled with roots, as long as you are paying attention to where you place your feet, this is walkable at a brisk hiking speed and is even a pleasurable terrain to walk upon. In terms of feeling, this does not compare even remotely with the painfulness of some parts of the Shoushan national park hike. There is however one delicate passage, which is a rocky embankment which might be complicated with shoes and more without because of its jaded nature. However, I managed to cross it without problems. 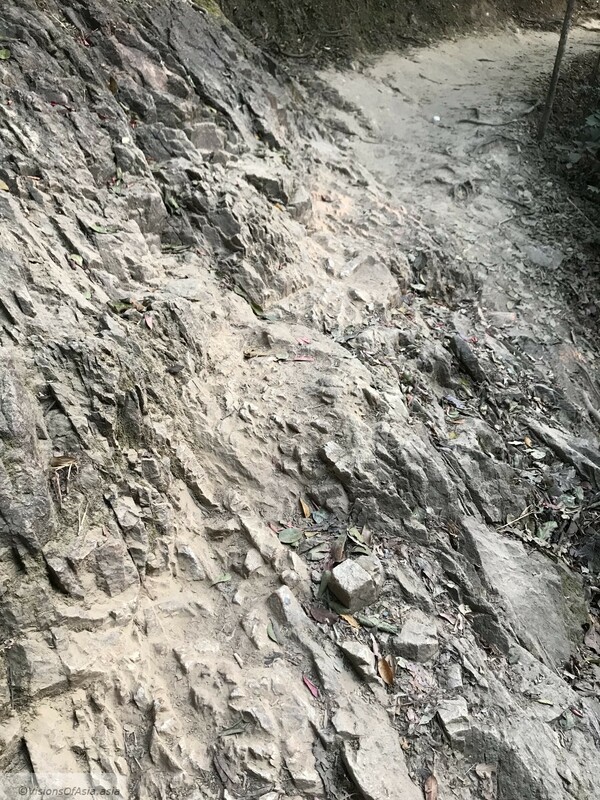 Before getting to the Dragon’s back ridge, there is a rocky climb, which is pretty slippery with shoes and very easy to climb barefooted. It is where you start recognizing the sandy nature of the trail. I managed to climb the ridge with no issues and even took a video for you to see how easy it is. The view from the top of the Dragon’s Back ridge is truly marvelous. Even more so, when you fly a drone. Of course, I did fly my drone around to take some shots of the environment. This gives you an idea of the marvelous views on this very easy hike (even five-year old kids can complete it). 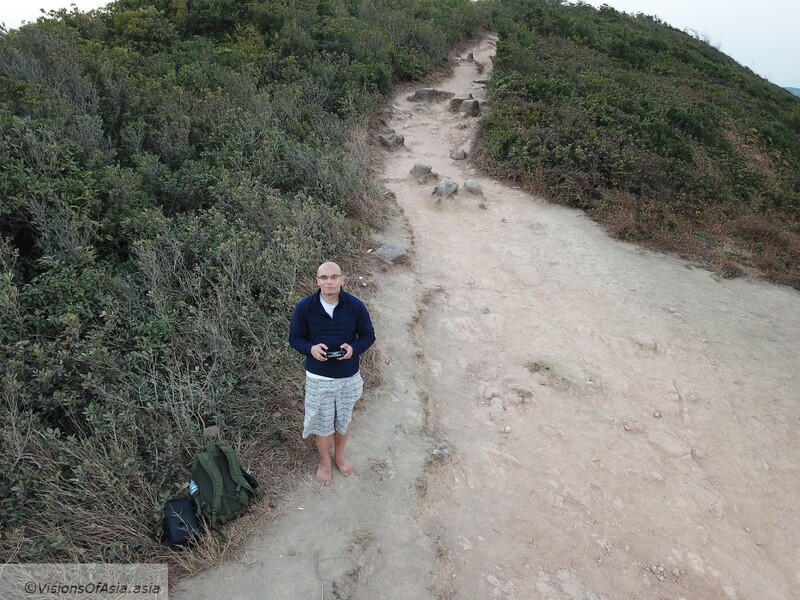 Finally, I took a “dronie”, that is a drone selfie. At that point, I was still very much near the head of the ridge’s trail, and it was getting dark very quickly. Fortunately, as you always should, I had taken my headlamp with me, allowing me to see the trail at night. In fact, the Dragon’s back trail, while totally easy, can become dangerous. If you don’t see where you are setting your feet, especially when you are hiking barefoot, you might slip and hurt yourself. So if you are hiking in the late afternoon, always pack a torch or a headlamp. The Dragon’s Back trail typically ends at its highest point, marked by a placard. 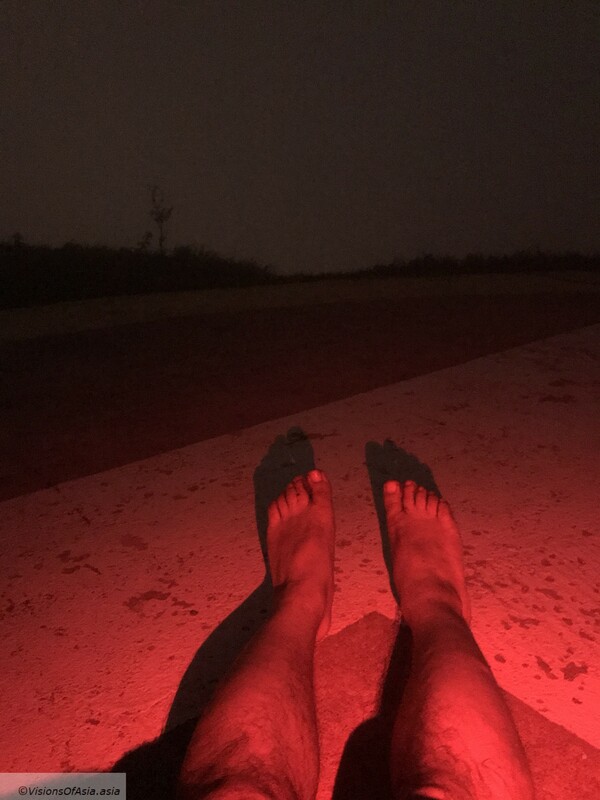 It is where I chose to take my last picture of the trail: illuminating my feet with the green light of the lamp while using the background light of the Big Waves beach. Sorry for the poor quality, but it was pitch dark by then. I also used my camera on long exposure, but without tripod (hence had to leave the diaphragm wide open). The result is still lovely, as it captures the blue hour perfectly from the top of the Dragon’s Back trail. A view from the Dragon’s Back at night. After that, the remainder of the trail was pretty straightforward. I just had to get back down to To Kwa Wan, which is the end of the trail near Shek O village. Nevertheless, of course, a headlamp was a requirement as the moon did not shine over the trail. Getting there is pretty easy. You take the MTR to the station Shau Kei Wan (or Chai Wan, but it involves climbing through the Sai Wan cemetery). At Shau Kei Wan, you take the bus number 9 direction Shek O beach. 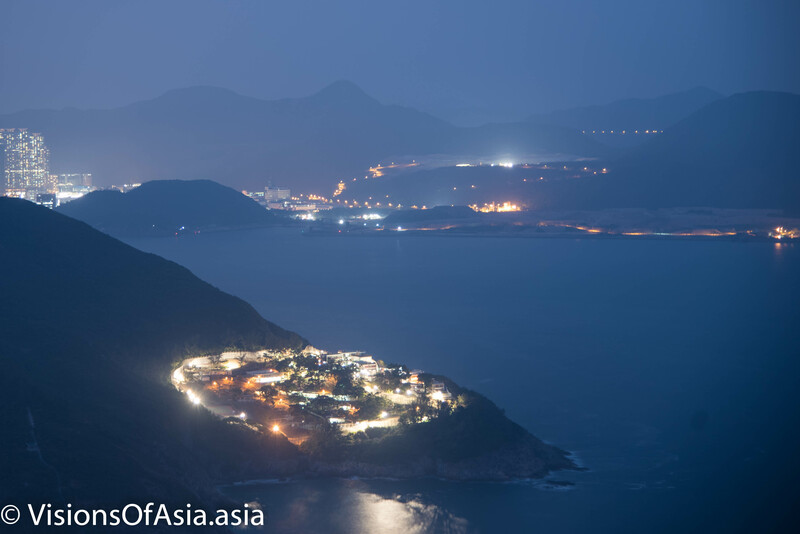 You must alight at Tai Tam gap correctional institution and there starts the hike. Upon arriving to the end of the trail you will be at the To Tei Wan bus stop. 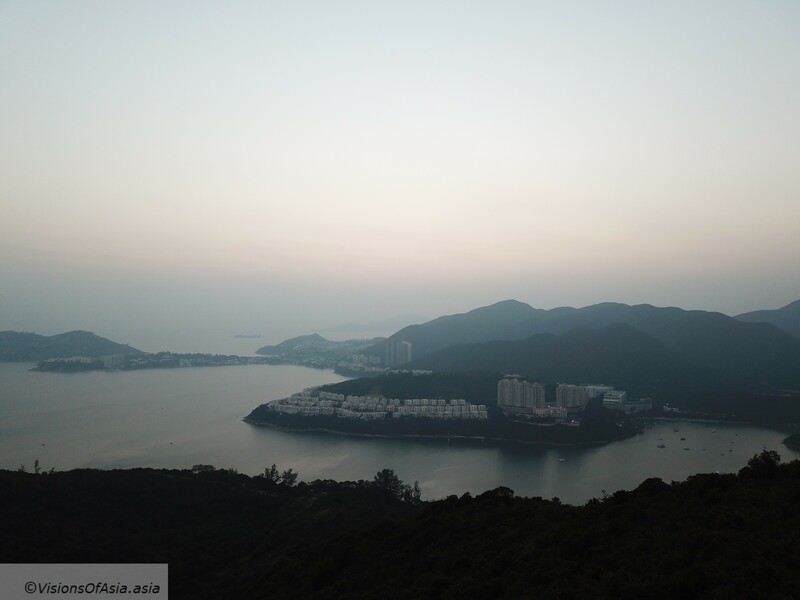 From there you can catch the number 9 direction either Shek O (to enjoy the beach) or direction Shau Kei Wan. 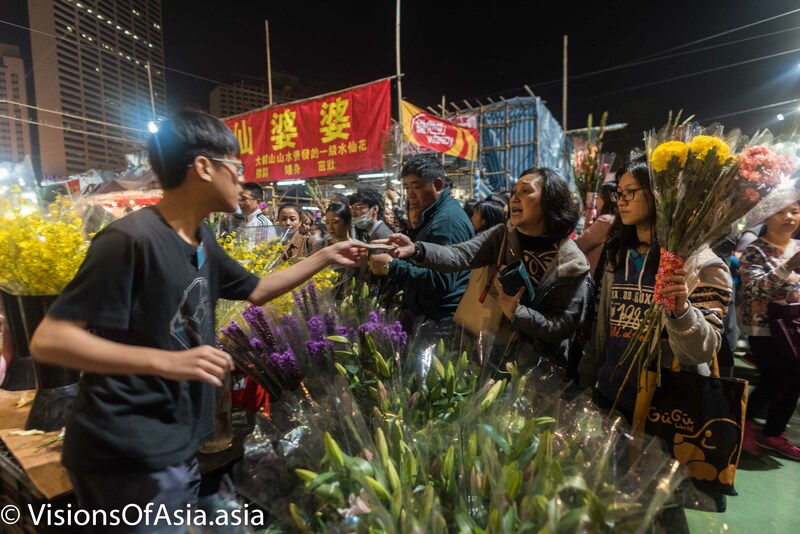 On week-ends, in general, the bus is already full at Shek O, and gets even fuller at To Tei Wan, so a better option might be to take the number 9 to Shek O and grab a minibus to Shau Kei Wan. 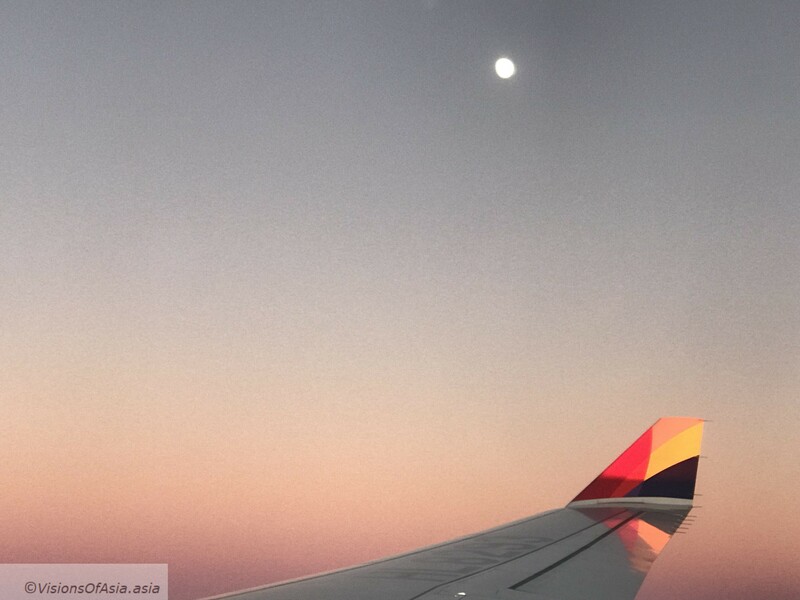 It was the moment sunset shined over the winglet of the A330, while the moon rose in the background. I didn’t have my camera with me, so I had to use my IPhone, but the picture is surely in itself magical. I guess travelers live for these moments, where everything aligns for a lovely moment and a lasting memory. 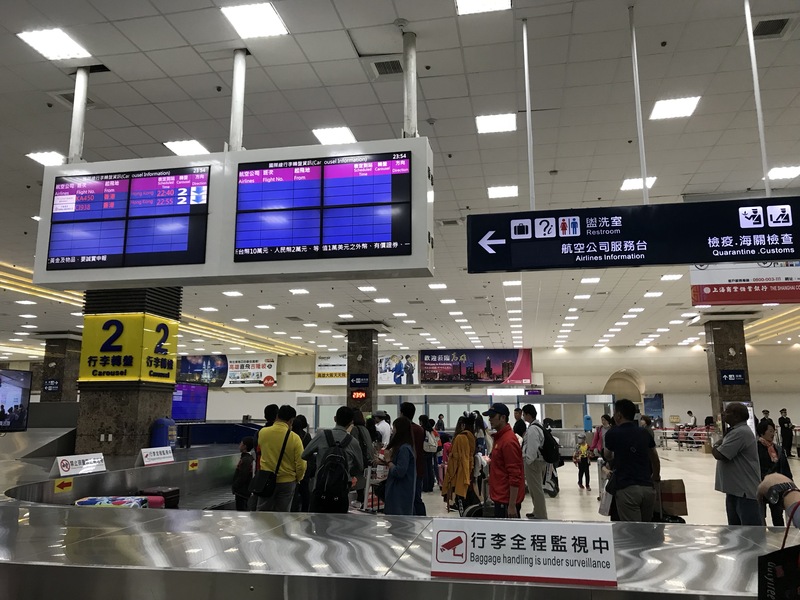 Last Sunday, I was flying to Kaohsiung, in Taiwan. 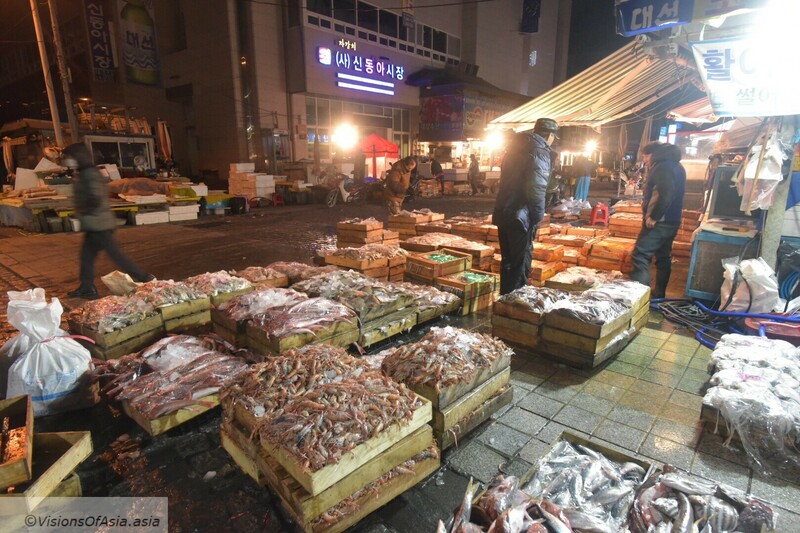 This trip took place thanks to a promotion of American Express and Zuji, which both offered tickets to various destinations around the world for 30,000 pts on your credit card. The offer was too good not to enjoy (although flights are always on inconvenient dates, but not a big deal if you are taking vacations anyway). As you never know what you might find on the plane as food, I had my dinner at the Premium Lounge of the airport (which you can access with a priority pass card (often given for free by some cards issuers). 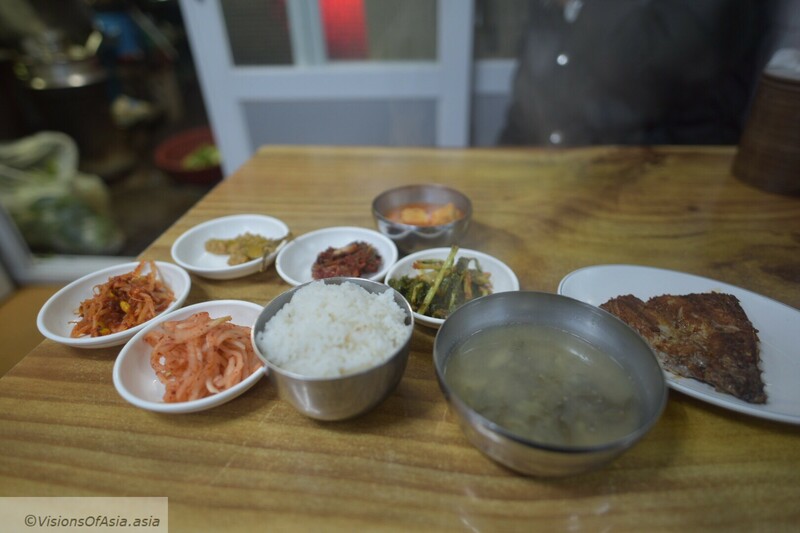 Chicken, rice and vegetables as well as mushroom soup were on my menu. Nothing to talk home about, but certainly more tasty than on the plane. China Airlines is the largest airline in Taiwan and is part of the Skyteam alliance (uniting some older European airlines such as Air France or KLM). 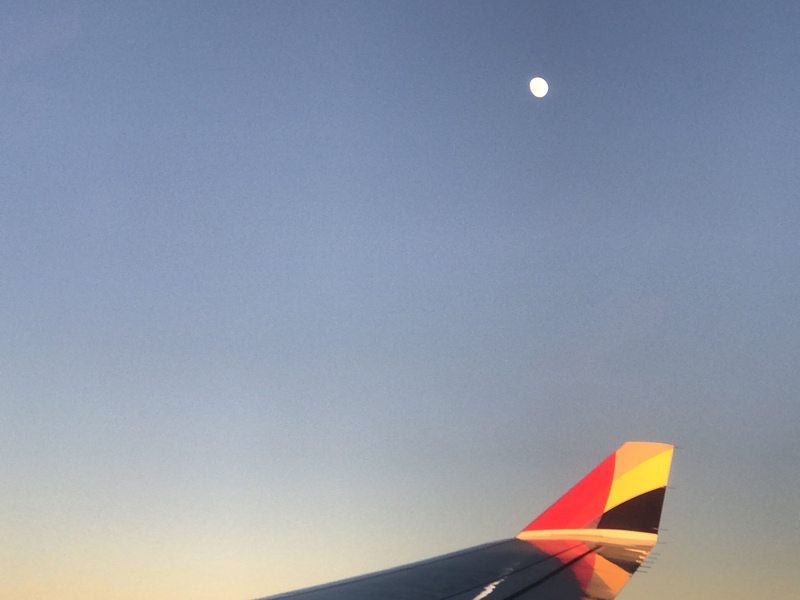 I didn’t know that company or had never flown on their planes until now. 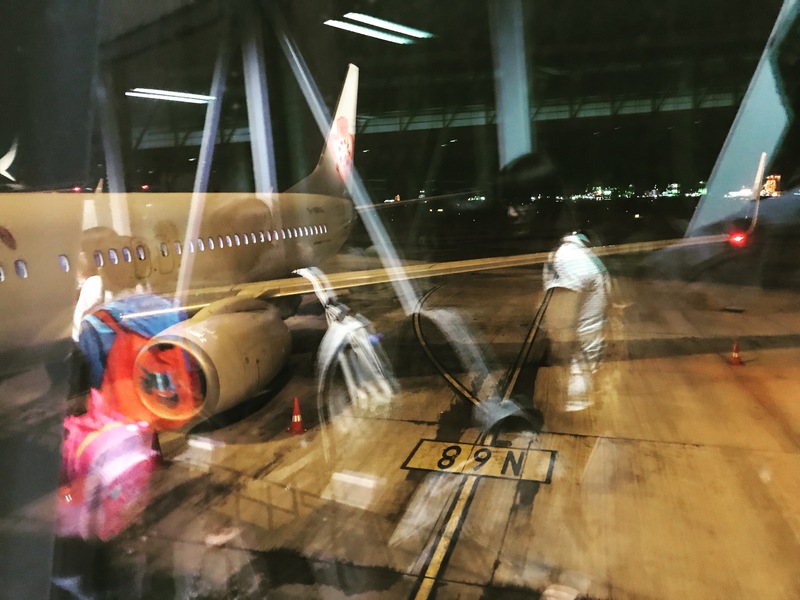 In economy, the service is quite ok, even if the flight attendants had to be scrambling around to feed everyone given the short duration of the flight. 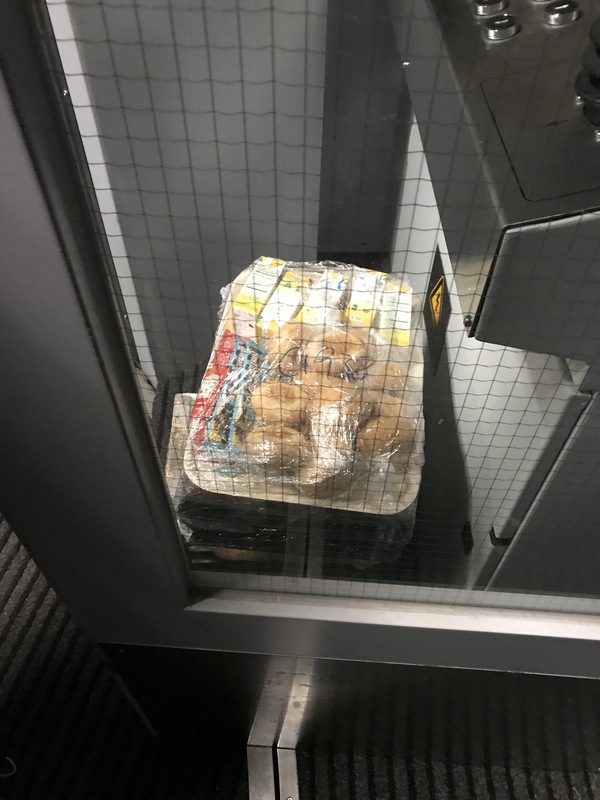 In business instead, I would be a bit more doubtful, as I saw them storing the food temporarily on the floor just outside the plane (all wrapped up, of course). 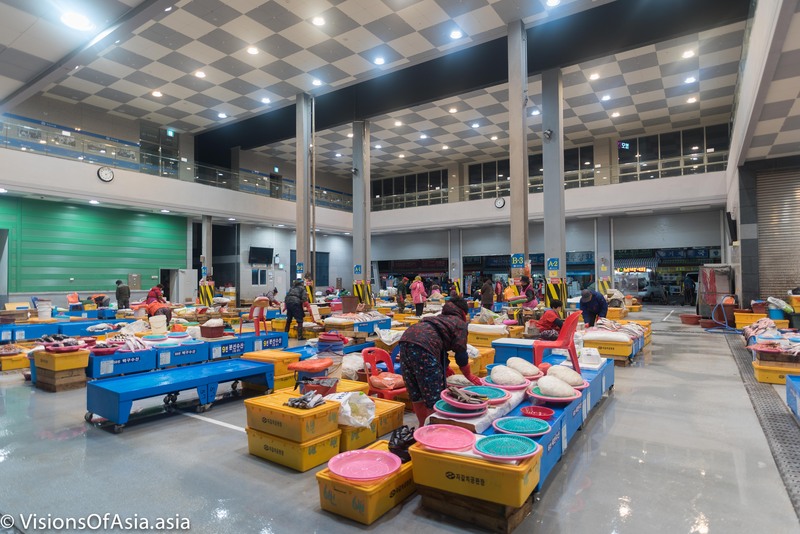 Food stored on the floor for the flight to Kaohsiung. Departing, we had a huge delay, so we arrived only at midnight in Kaohsiung, too late to catch any MRT. The worst part is probably that on the return flight, they were also delayed! 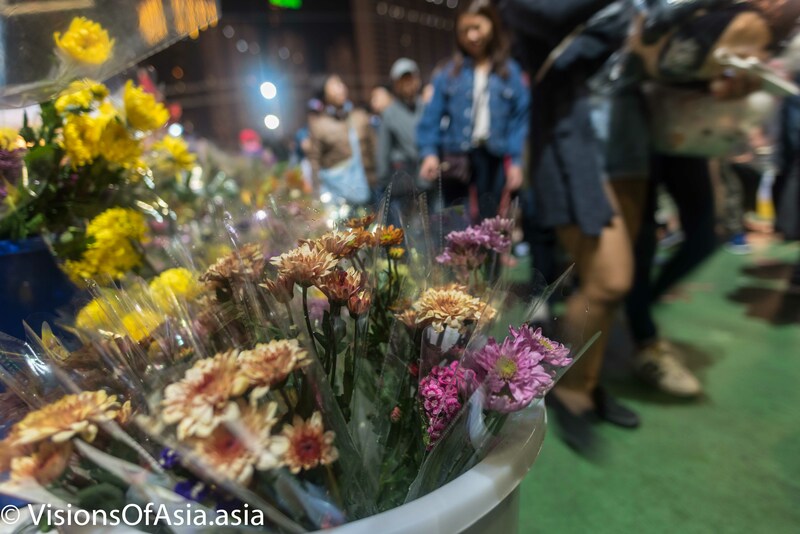 In this case, however, the delay was less meaningful, as HK has plenty of transportation options until late at night (and even during the night). I mentioned about the short duration of the flight? Well, given their seemingly systematic delays, China Airlines “pads” its flight time and for a flight time of 1h10, they announce actually 1h40. 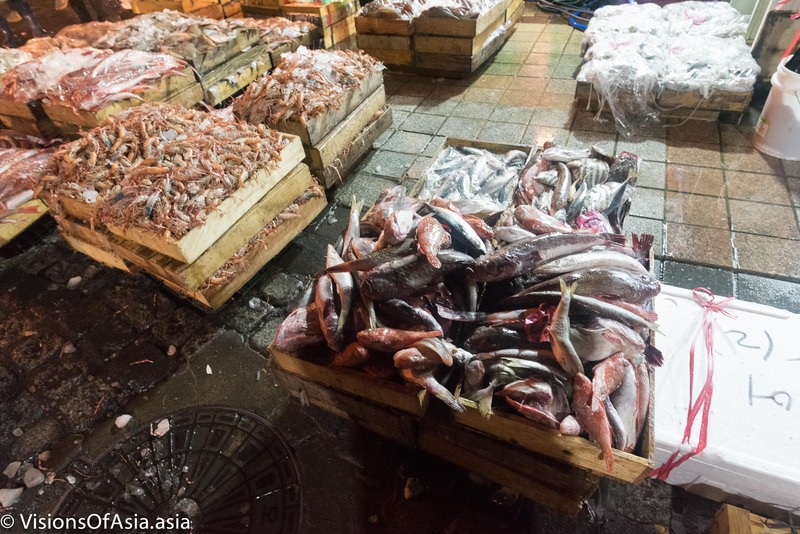 Arrival in Kaohsiung: already welcoming! 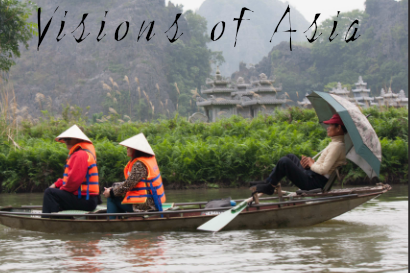 I have had my share of experience with immigration authorities in various countries. 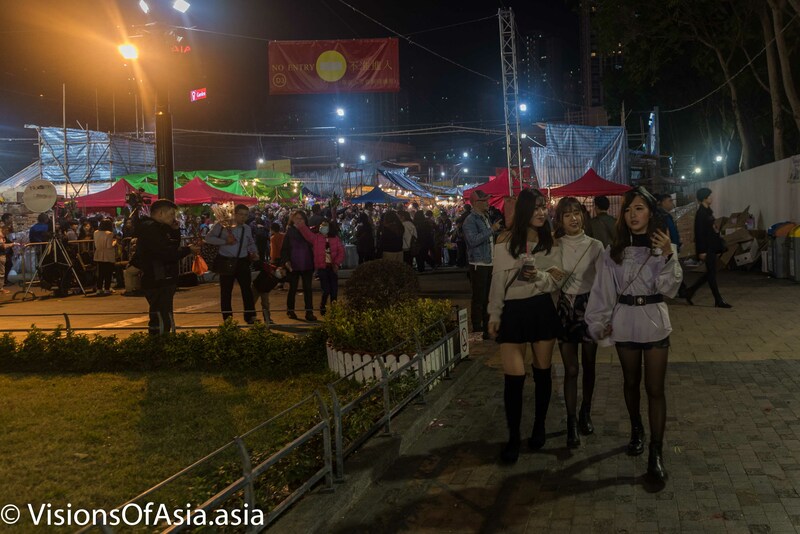 However, Taiwan was one of the most welcoming immigration experience I ever had. You must just give your passport and affix your two indexes on a digital print scanner upon arrival as well as upon exit (and complete an arrival card). Less easy than the entrance for residents in Hong Kong, but still easy and fast. 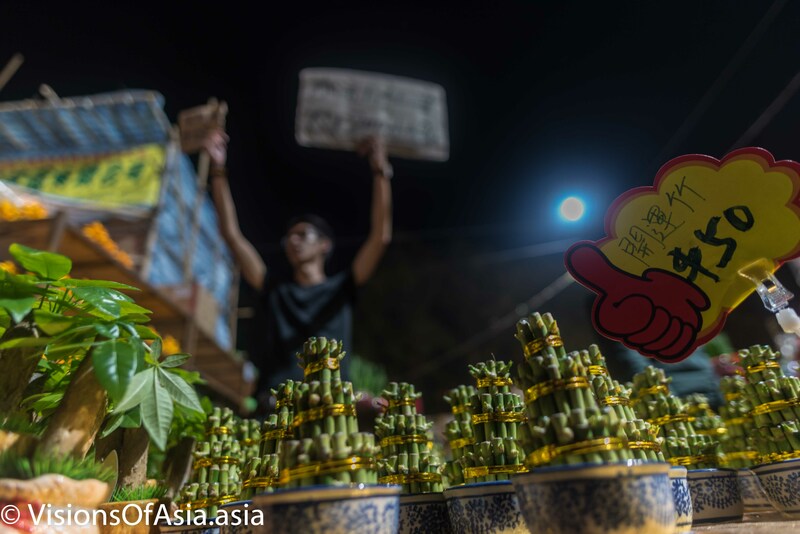 Of course, absolutely not comparable to the living hell that can be the Thai immigration. Luggages were distributed pretty quickly from the plane to the conveyor belt. The hotel room at Art eyes Sunduo. The view from the hotel room was gorgeous, however. 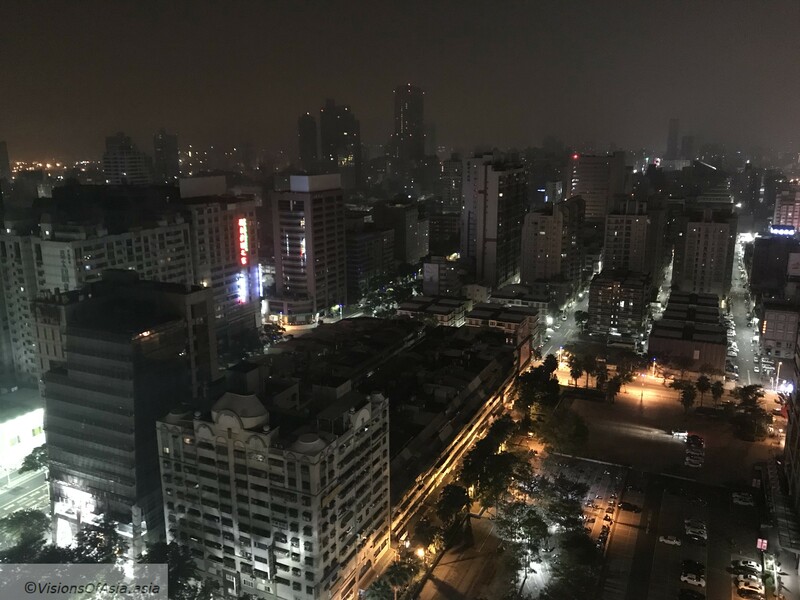 The gorgeous view from the hotel at night. The following day, I was getting ready to start a long hike…. Which I will relate in my next post! Once again, I was back up on Kowloon peak. After previous visits with the photography meetup, with the hiking meetup at night, and solo during the day, I joined a hiking meetup that was passing through suicide cliff. I abandonned the group once at Suicide Cliff, mainly because hiking meetups are focused on covering as quickly as possible the most distance, whereas I prefer to focus on photography. In this case, I was aiming at shooting the sunset at suicide cliff. 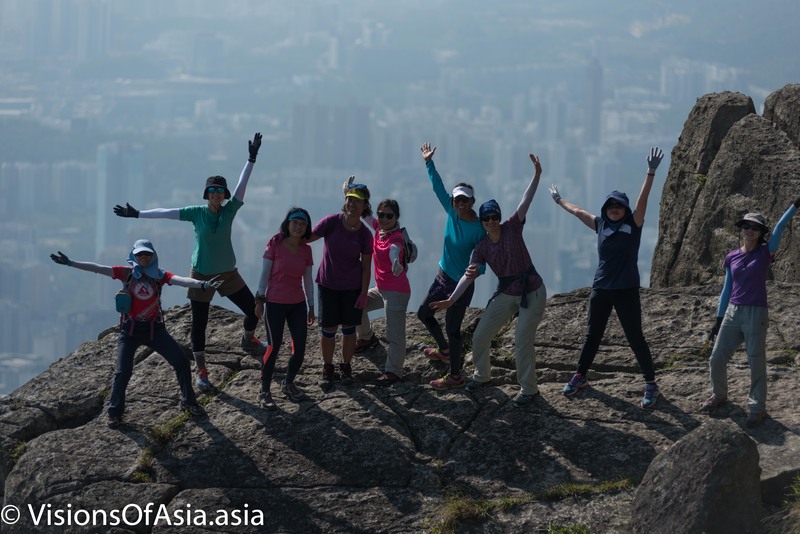 As the hiking meetup climbed Kowloon Peak at a breakneck pace (I was last and dragging with 15 kgs gear, yet broke my own personal record), we arrived up there at around 14.00 to 15.00. As you can imagine, 3pm is not exactly the time for sunset. So, I shot all the members of the meetup who wanted their pictures taken at that picture perfect spot. The HK Hiking Meetup team posing for a picture on Suicide Cliff. Later, I broadcasted a periscope (unless I am mistaken, the first one ever taken from up there) https://www.pscp.tv/w/1ypKdNDAALdJW . 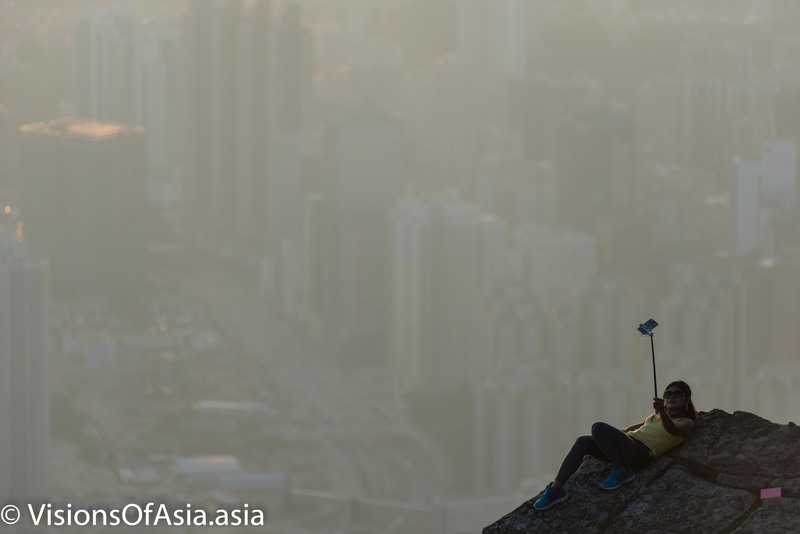 A Filipina takes extra risks for a selfie on hazy background. The other surprise of the day was seeing a Japanese family bring their kid along for the hike. I guess that it is generally considered as pretty “safe” despite the steepness of the mountain and the rock clambering required. 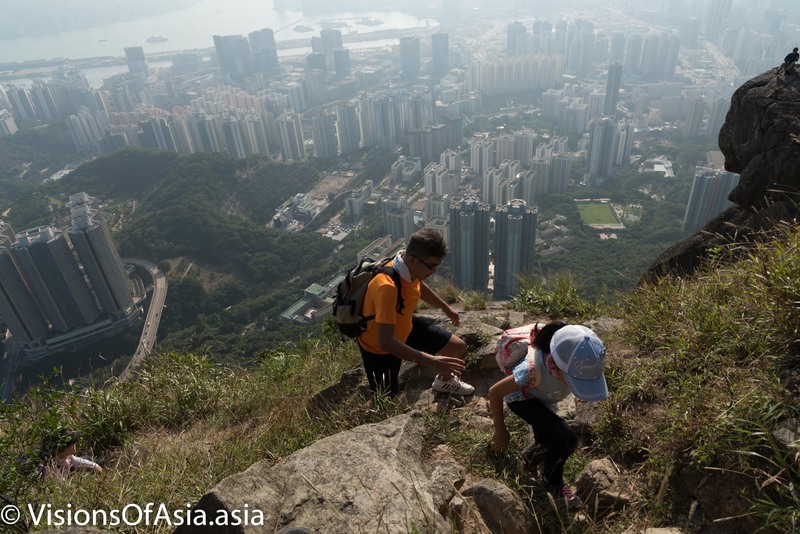 A Japanese family brings along their daughter on Kowloon peak. After three long hours of wait, the sun began to descend on the horizon. It was the occasion of starting to shoot, and obviously, the big issue was that everybody wanted their picture with the sunset, while I was hoping for an empty cliff. However, the addition of a human element allowed to provide a size element for a sunset at suicide cliff, so that is the picture I opted to keep. As the sun kept going down on the horizon, I was gifted with my very own “Apocalypse Now” moment. A Government Flying Service helicopter decided serendipitously to fly into the setting sun allowing me a wonderful shot (obviously, as I was shooting with an 80-200, I had to crop to the max to isolate this picture). 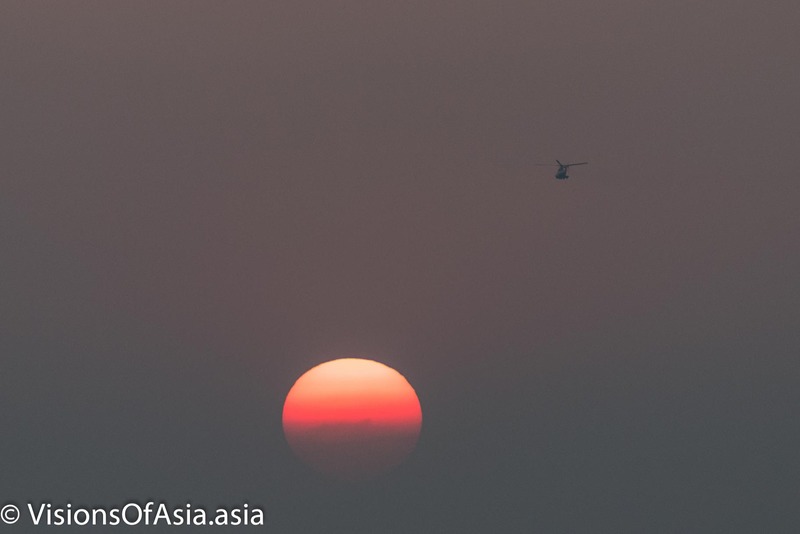 A GFS helicopter decided to fly into the setting sun as it reached the final moments of sunset. After the sunset took place, suicide cliff looked barren. I did not stay for a night picture, as you can see a previous attempt here. Instead I wanted to move up, away from suicide cliff before nightfall. Incidentally, I wished to take a pic from the rock above. 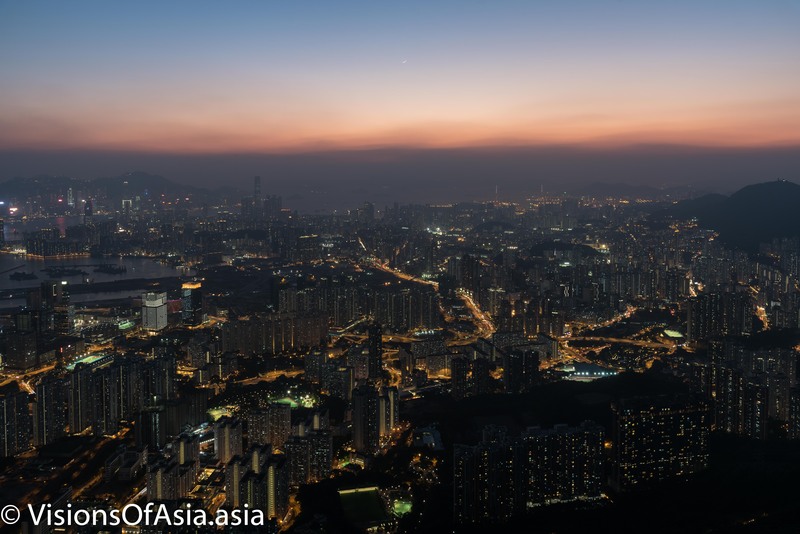 Obviously, the view from Kowloon Peak is majestic and impressive, and even more so during the blue hour, immediately after sunset. I got the occasion of using my tripod there, as I had been dragging it for the whole hike (I think my combined gear was around 15 kgs). Fortunately, after sunset, the haze that had been worrying me before sunset dissipated greatly allowing some interesting shots of the sunset. 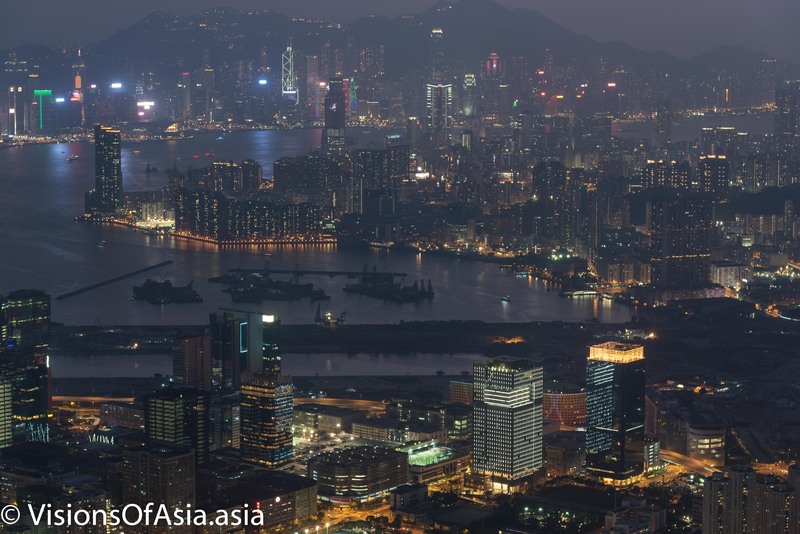 View on Kowloon from Kowloon Peak. I took several pics, but chose to focus on a general view of Kowloon and this other picture, which focuses on Kowloon Bay. After these pics I headed down through the stairs leading to Fei Ngo Shan. I must have been pretty tired, as I tripped once, grazing my right knee. My ankle also kept buckling, so my guess is extreme tiredness. I was wearing low-cut Reebok trail running shoes (ideal when climbing, contrary to my hiking shoes, whose sole is too rigid). While good for climbing, the shoe does not support your ankle when buckling. I ended so tired coming down, that I took out my shoes and walked the rest of the way barefoot (thus enjoying a free massage too). There is one point on which I would like to call your attention, if you are planning on going to Suicide Cliff. A helicopter of the GFS had to come again and rescue hikers from the mountain today, around sunset. This is becoming pretty usual now, and that testifies to the inexperience or callousness of many hikers. When you don’t know the way, take the stairs on Fei Ngo Shan. When you are inexperienced, don’t go through Jat’s Incline route. If you are tired or prejudged from your strength, you should have thought about it beforehand. Helicopters are used on important rescue missions, not to help wary or lost hikers. So, please, please, do be careful and don’t be too adventurous when tackling suicide cliff. There are well-marked trails which are adventurous enough without going on dangerous paths. 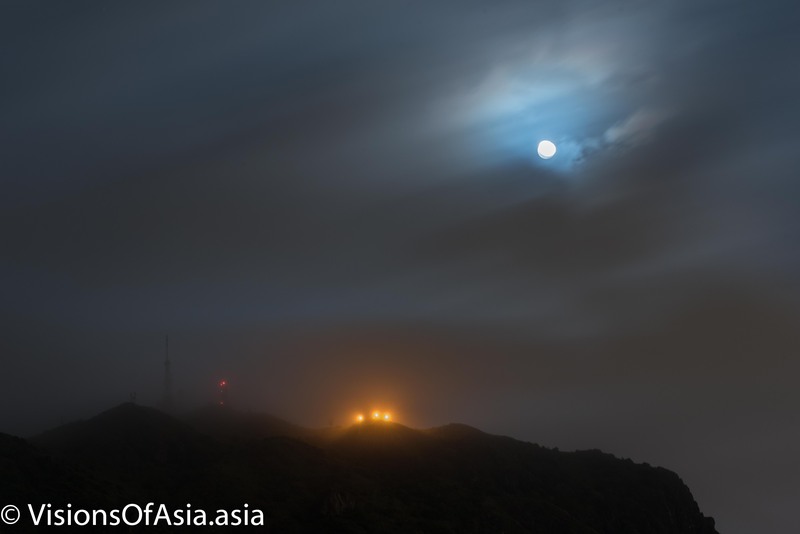 I posted a few weeks ago a picture of a moon crescent over Kowloon Peak. Yesterday night, the stars were aligned again, this time with the full moon. The clouds gave both a mysterious tone to the mountain, and at the same time, as they covered completely the mountain at times, spoiled several of my shots. 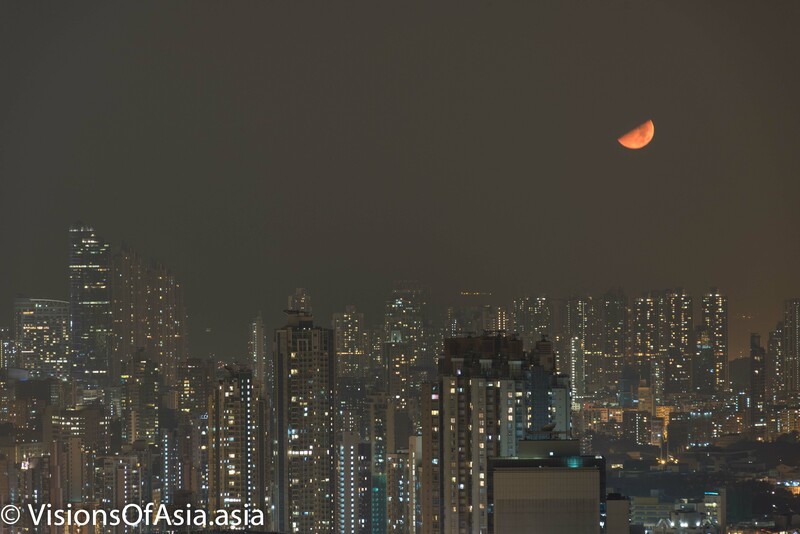 Tonight, there was a red moon on Hong Kong. As the moon crescent was well formed and the skies were somehow clearer, the moon could be clearly visible as it went down over the horizon. Sadly, as always where there is nice weather on Hong Kong, the sky still had some haze. Well, it is important to mention that earlier during the evening, the moon was not red. It was white. It got that reddish tone, simply because as it got lower, the atmospheric pollution caused the bluish components of the light to be lost. You can find an interesting explanation on the causes of that phenomenon on USCB Science Line. On the technical side, the picture was shot at 200 mm, and I raised the iso slightly to 400, in order to keep a faster shutter speed (exposure is still 15 seconds here! 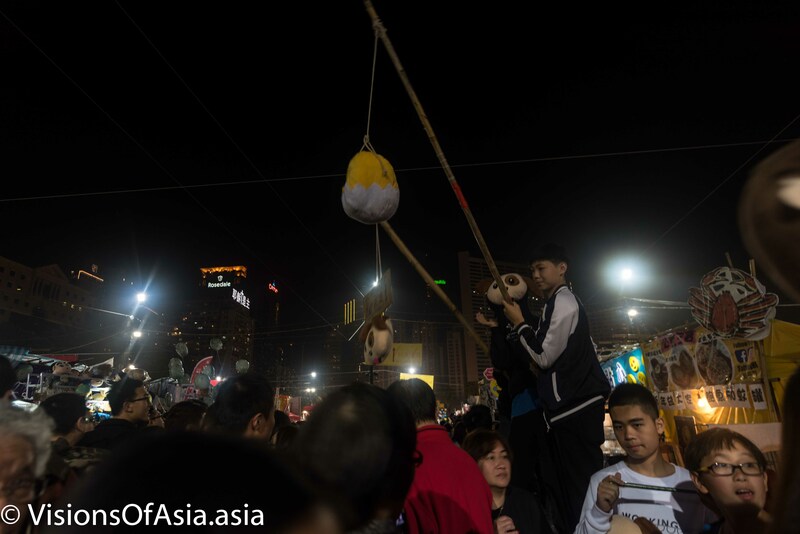 ), to try to keep the moon clear enough to be distinguishable. When you are doing astrophotography, an important part to bear in mind, and this is particularly true for the moon: the earth rotates! It may not seem as much, but the rotation of the earth is sufficient to cause a blur during the 15 seconds exposure on this picture. Astronomists generally use a gear that rotates slightly the camera to account for the earth’s rotation, but obviously, that’s not my specialty right now. How to get the moon clearer? You can opt to try shorter exposure times by opening the diaphragm and increasing the shutter speed to keep exposure as short as possible. Obviously, it gets tricky with you include darker elements such as a cityscape. In the end, as always, it ends up being a question of choices and compromise. I made the choice to keep the picture with as little grain as possible while reducing exposure time to try and minimize the effect of earth’s rotation. Last Saturday, I decided to take a stroll on a spot I had noticed while riding the minibus 68. Kwun Tong promenade was built between 2010 and 2015 and hence still looks pretty fresh and new. 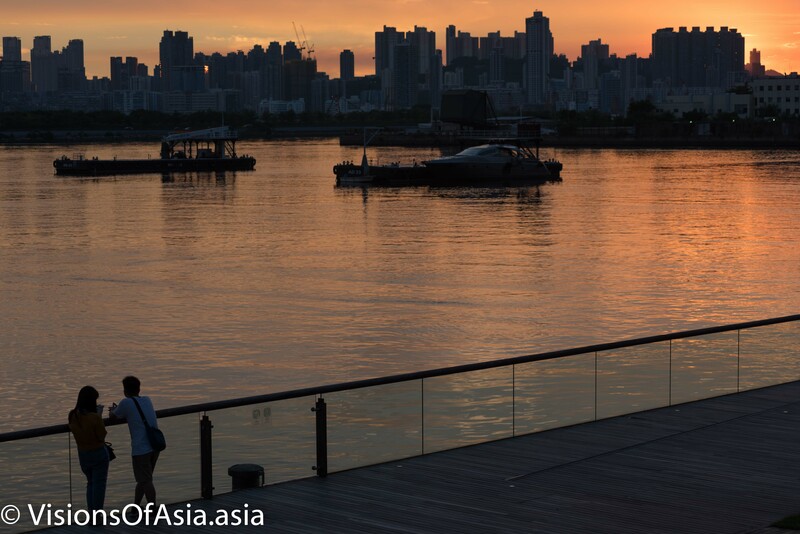 Built on the site of the former Kwun Tong Public Cargo Working Area home to many paper recyclers, this promenade offers a lovely sea front view at sunset. 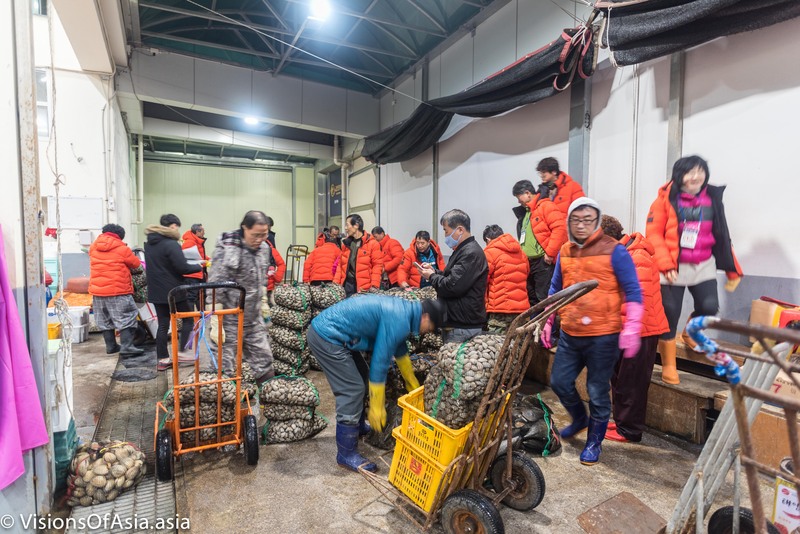 Nevertheless, when comparing to Victoria Harbour or the peak, the view on the Kwun Tong harbour is somehow cluttered by a number of industrial structures, like construction boats. If you can make abstraction from these distractions, then, Kwun Tong Promenade a is lovely place to have a midsummer stroll and take a few pics. 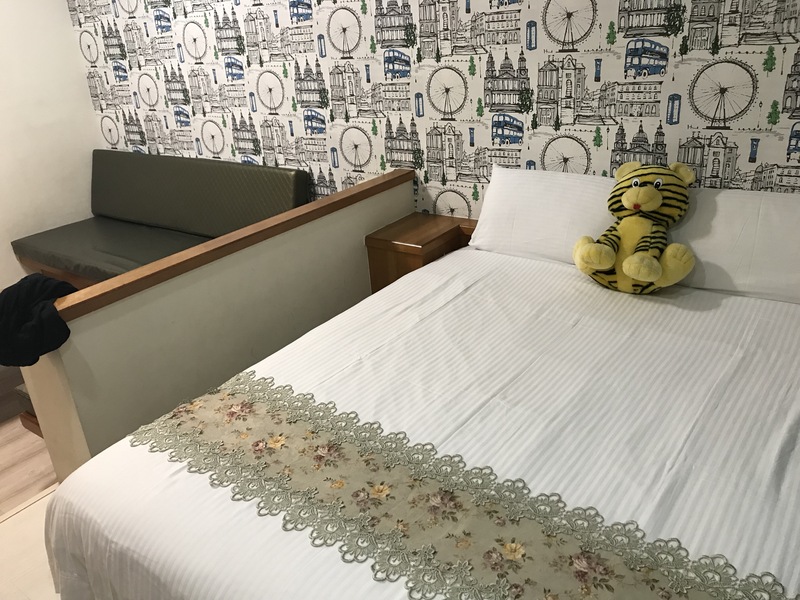 Getting there might be problematic, as the nearest MTR station is Kwun Tong, but you have to walk about 1 km to get to the place. 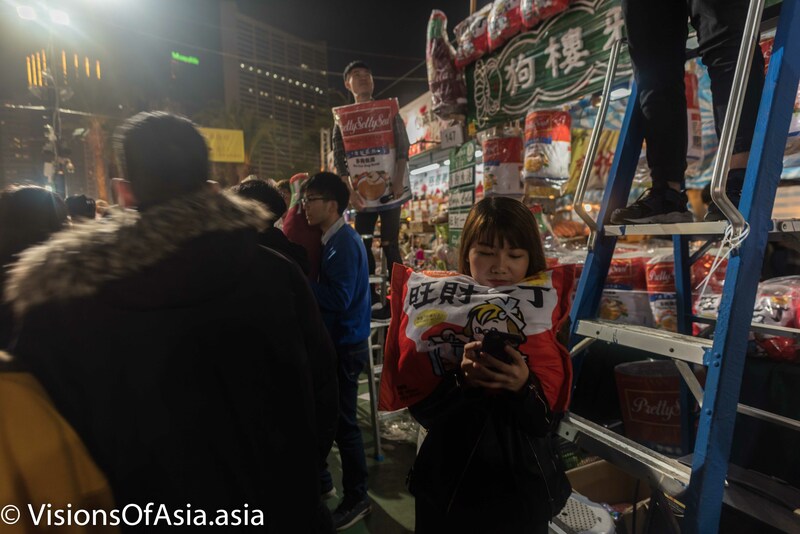 An easier way of doing it is to go to Kowloon Bay MTR, walking or taking the shuttle to the Megabox mall and catching the minibus 68 there. You may also catch the 68 from Choi Hung MTR if you prefer (easier, as you arrive on the same side of the street as the promenade). As usual, no real way of telling which station to stop too, but when you will see the lamps featured in my pics, you can call out to the driver to stop.